‘Super Trim’ was born in a small shop front in Sydney Rd, Brunswick, Melbourne, Victoria, 1960. 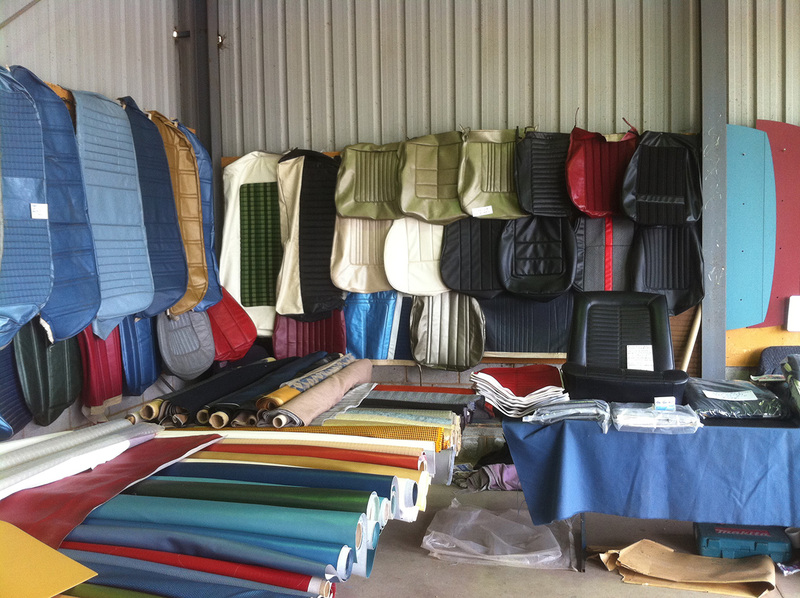 Created by Motor-Trimmer, Henry Trapani, the business catered for the repairing & retrimming of seats, headlinings, carpet-sets, floor-mats & ute tonneau covers in various passenger & commercial vehicles. By 1965 the business had grown to a staff of three apprentices, seven tradesman, three office staff, three salespersons & two general hands. This saw the need for larger premises with greater workshop space & off-street parking. In 1966 ‘Super Trim’ opened its new premises at a purpose built factory at 43 Charles Street, North Coburg (where it still operates today). With the demand of ‘Vinyl-Hardtops’ or ‘Vinyl-Tops’ into Australia, Super Trim became one of the biggest suppliers in Victoria. There was such a great demand for placing exterior vinyl onto the roof of many late 60s, early 70s’ cars, the staff at North Coburg reached 51 paid employees by 1971. In fact, one week in 1971 saw a record of 67 vinyl hardtops fitted to customers vehicles! This saw the need for expansion of Super Trim. In 1973 the first branch of Super Trim, outside of North Coburg was opened. It was in Rooks Rd, Nunawading. Followed by Frankston. Then, in 1976 a branch in La Trobe St, Melbourne. Then, Hoddle St, Collingwood in 1981. The customer demands of motor-trimming peaked in the 1960s’ & 70s’. By the mid 1980s’, a downturn in the need for repairing, or replacing interior trim in passenger cars had been realised. This saw the closure of all branches, except for North Coburg & Nunawading. Not long after this, in 1985 the Nunawading branch changed ownership. 1989 was a bleak economic period for many small businesses in Australia. Super Trim-NORTH COBURG was not the thriving business it once was. At this stage Henry’s son Paul commenced a four year motor-trimming apprenticeship with Super Trim. This saw a different approach to the day-to-day workings of the business. Where the plush velvets, & pop-up sunroofs of the mid eighties had claimed the original FJ Holdens, VC Valiants and XM Futuras, it was now time to turn the clock back & refit vehicles with metallic vinyl seat covers, rubber floor mats & vinyl headlinings. This stage was enhanced, not only by Henry’s vast knowledge & experience with vehicles from the 1930s’ onward, but the fact he had preserved over 50 years of original leather, cloth & vinyl he had purchased from car manufacturers from 1950s’ onward. By 1992 the workload had doubled as demand for quality repair & retrimming of classic 50s & 60s marques had grown. Many customers were extremely relieved to have Super Trim supply exact authentic materials to restore their pride & joy. In 1995 Super Trim was strengthened with the commencement of Henry’s son Mark into a four year motor-trimming apprenticeship with Super Trim. Continuing with the new direction of the business, Mark brought attention to detail, heavily researching original sales brochures of the Ford, Holden & Valiant models he had been brought up on. Henry & Mark worked together marrying the original specifications of vehicles, along with Henry’s vast array of templates & patterns to recreate authentic reproduced seat covers and headlinings. The business continues today as a great supplier of original materials & trim items to many customers throughout Australia, New Zealand & the World. Super Trim holds a wealth of knowledge & materials to cater for many interior trim items for many different vehicles.